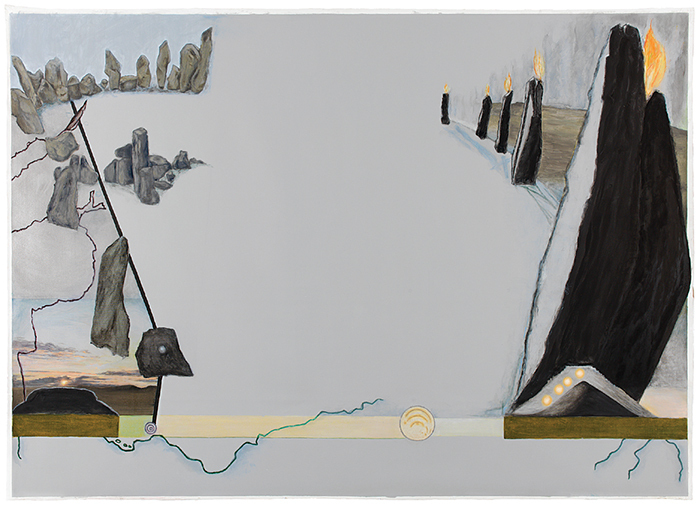 Jo Baer, Dusk (Bands and End-Points), 2012, oil on canvas, 86 1/2 × 118". In 1983, Jo Baer announced she was no longer an abstract painter. Instead, she said, she was committed to working in a mode she dubbed “radical figuration.” However, as “In the Land of the Giants,” the series of paintings she has been making since 2009, demonstrates, you can’t ever really think abstraction without figuration or vice versa. Even as she dedicated the 1960s to patiently exploring and exploiting the parameters of the abstract canvas, her vision from the outset expanded beyond its limits.